Matthew J. Parlow, new dean of Chapman University’s Fowler School of Law. 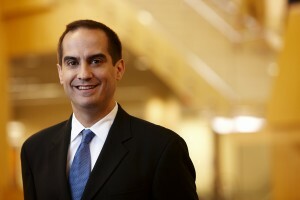 Parlow, a native Southern Californian, returns to Chapman after serving as associate dean for academic affairs at Marquette University Law School, where he has taught for the past seven years. He served on the Chapman University law faculty from 2005 to 2008. Parlow has also been a visiting professor at Yale University, and a fellow at Loyola Marymount University. Parlow’s nationally recognized expertise in land use and urban redevelopment, his passion for sports law, and his tenure as associate dean at Marquette highlights the wealth of academic and administrative experience he will bring to the dean’s role. Following a wide-sweeping national search, Parlow was selected by a prominent search committee that included Reginald Gilyard, Dean of the Argyros School of Business; Thomas Phelps, co-founder of Manatt Phelps, an international law firm; Parker Kennedy, chairman and chief executive officer of First American Financial Corporation; Wylie Aitken, president and founding partner of Aitken, Aitken & Cohn, and selected faculty of the Fowler School of Law. In the five years of Dean Tom Campbell’s tenure, the Fowler School enacted a broad practice-ready curricular overhaul, created a new Business Law Emphasis program, and received a major naming gift for the law library from the Hugh and Hazel Darling Foundation. In 2013, the law school was named the Dale E. Fowler School of Law in grateful recognition of a $55 million gift by Ann and Dale E. Fowler, one of the largest single gifts to a U.S. law school. Upon the conclusion of his term, Campbell will return to teaching as a full time professor on the Fowler School of Law faculty. and 2015 marked the fifth year that graduates exceeded the California ABA-accredited law school average pass rate on the state’s bar examination. The Fowler School is one of only seven law schools in the state to have exceeded the state average pass rate in each of the past five years.
. He earned his bachelor’s degree from Loyola Marymount University in Los Angeles. Prior to his academic career, Parlow was an associate with the Los Angeles firm of Manatt, Phelps & Phillips, LLP, specializing in real estate, land use, environmental, and local/state government law. He also served as a law clerk for the Honorable Pamela Ann Rymer of the United States Court of Appeals for the Ninth Circuit. He also serves as a consultant to professional sports leagues and teams, and has served on the board of directors of several nonprofit organizations, as well as been appointed to a number of local and state government task forces. Parlow is married to Janine Kim, a professor of law at Marquette University Law School, who will also be joining the Fowler School of Law faculty. She teaches courses in multiple areas of the law and her primary areas of research include criminal law and race and the law. Prior to teaching, Kim clerked for the Honorable Alfred T. Goodwin of the United States Court of Appeals for the Ninth Circuit and was an associate with Simpson Thacher & Bartlett LLP in New York. She received her J.D. from Yale Law School and her B.A. and M.A. from Stanford University.